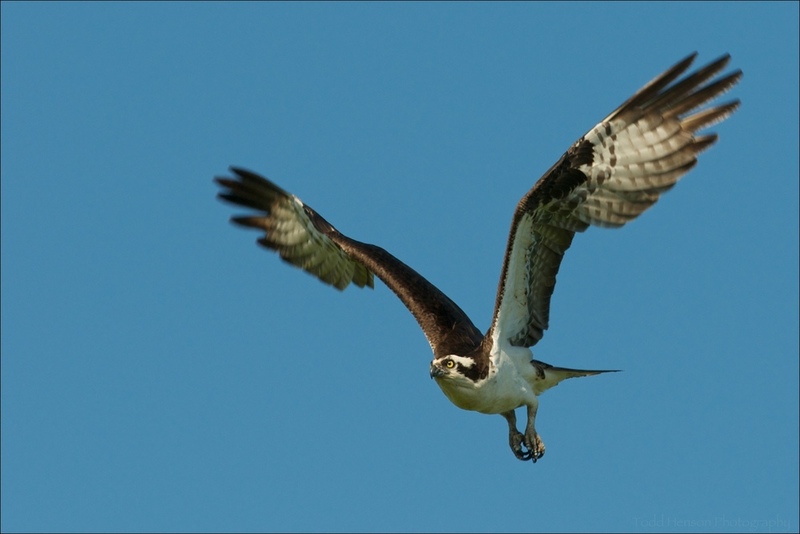 Osprey are magnificent birds of prey that nest near bodies of water. They will hover over the water, watching the fish below, then dive feet first into the water to grab hold of a fish with their talons. When they catch a fish they usually hold it facing forward as they fly to a tree to feed or back to the nest to deliver the fish to the mother and young. Unfortunately I've seen many instances of their nest not being able to stand up to the elements. They sometimes build nests on duck blinds out in the water. In one case the duck blind was in serious disrepair and collapsed during a bad storm. Thankfully it was prior to the Osprey laying eggs. The two birds tried briefly to rebuild the nest on the remnants of the blind, which was almost at water level, before moving on to a better location. Osprey stretching. It's nest was in a tree not too far out of frame. In a different instance the nest was blown right off the top of a duck blind. 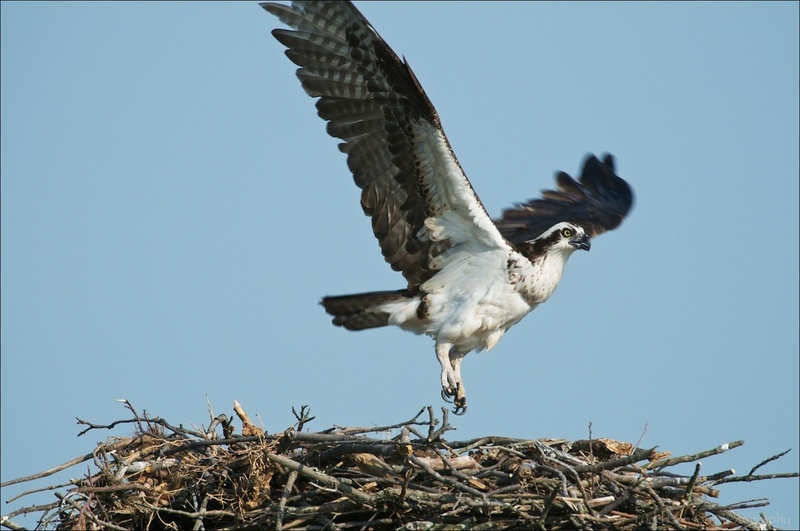 And yet, the pair of Osprey return each year and rebuild the nest. In several cases a nest in a tree collapsed, along with the mother and young Osprey. In two instances I'm aware of the surviving Osprey were rescued by U.S. Fish & Wildlife Service Wildlife Biologists. Thankfully, despite so many instances of downed nests, the majority of Osprey I've seen have successfully hatched and fledged their young. I look forward to their return each year. Osprey mother and three juveniles feeding on fish in nest. The juveniles have the more orange eyes, the mother's are more yellow. Also notice, the juvenile still have light colored feather tips, the adults are solid brown. The remains of the fish are at the foremost Osprey's feet.